The Guringai Festival 2013 Live Life Loudly is definitely very much alive, giving all wonderful insights into life that are being heard loudly within Pittwater and on the Northern Beaches this week . 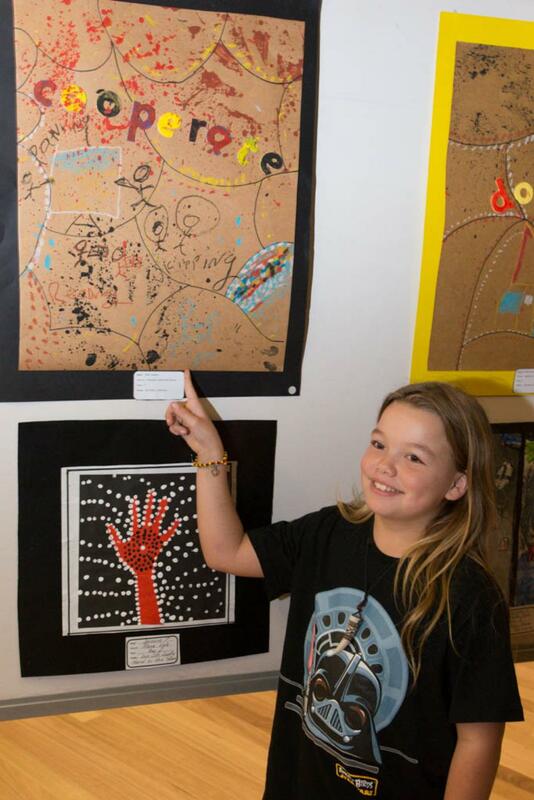 The wonderful children’s Penisnula CommUNITY of Schools Art Exhibition and ‘Melaleuca Moonlight’ held at Wheeler Heights Public school photos will bring a smile to your face just looking. 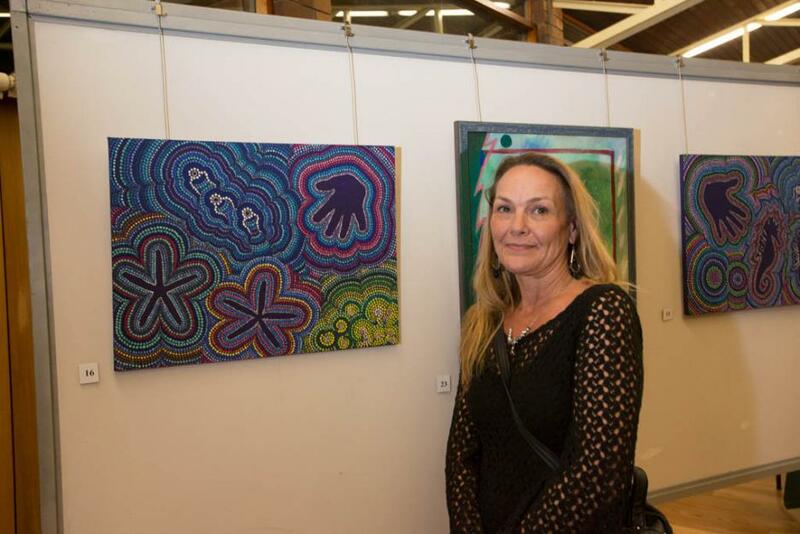 On Friday evening the inaugural Northside Aboriginal Art & Craft Exhibition officially opened at Mona Vale Memorial Hall and this too is a feast for the eyes, mind and heart. Curated by Clair Jackson, the exhibition is part of the 2013 Guringai Festival – celebrating Aboriginal and Torres Strait Islander culture in the Northern Sydney region. The artists represented are local Aboriginal people with a variety of skills; painting, photography, jewellery making, pottery and quilting. 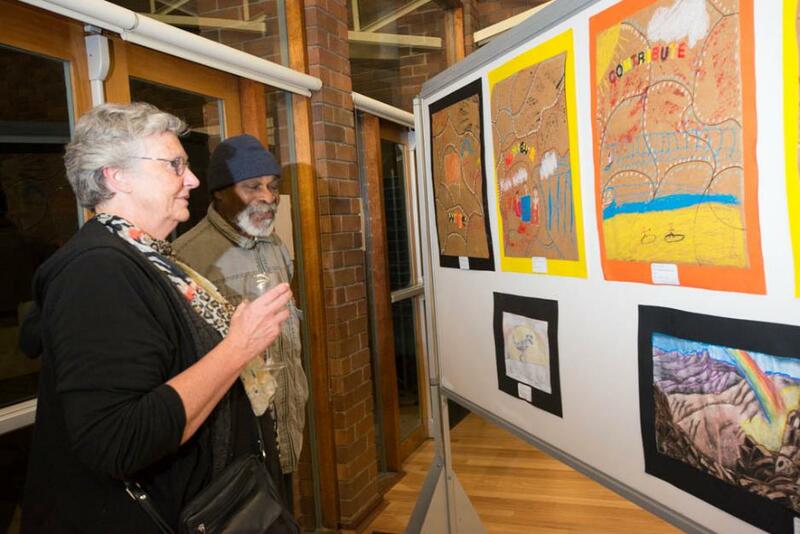 Also showing are works by imaginative and creative Aboriginal students of local primary and high schools who are within the Peninsula CommUnity of Schools. The children’s art is just beautiful and we look forward to see their art in years to come. Uncle Bob Waterer, a Guringai man welcomed everyone to country. Pittwater Mayor Jacqueline Townsend officially opened the exhibition. The exhibition is well displayed and easy to follow with help of the catalogue. One of the exhibition artists is well- known local artist Jessica Birk. She explained how many artists reconcile the fact that they can create art on land that is not their traditional land. "Belonging on the northern beaches is something I've grown into. Belonging up there [in the Clarence Valley] was something I was born into - a gift from my ancestors and my family." 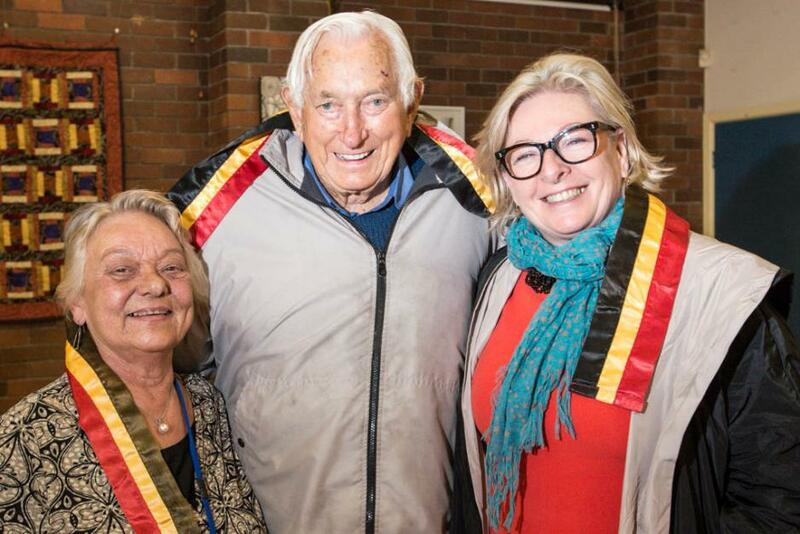 "To Aboriginal people land is what makes us who we are, what sustains us… As a Yaegl descendant of Northern NSW, born and raised upon Guringai land. This allows me an opportunity to bring my own artistic interpretation to this place, a unique connection I have as a local living Aboriginal person, to the Northern Beaches, it’s water, it’s land and it’s story..."
Like many artists, she uses her work to express her mixed heritage. Unlike many, she finds it easy to reconcile the two halves of her upbringing. "You can belong to more than one place and more than one culture," she says. Two Grass Weaving Workshops are being conducted with Karleen Green.1.00pm and 3.30pm. All classes are $15 each. Also on Sunday,1.00pm and 3.30pm, ‘Re-discover Bush Tucker of the First People of Australia’ will be held by local Guringai man Jess Relton and Yuin man Les McLeod. This will include tasting some bush tucker. 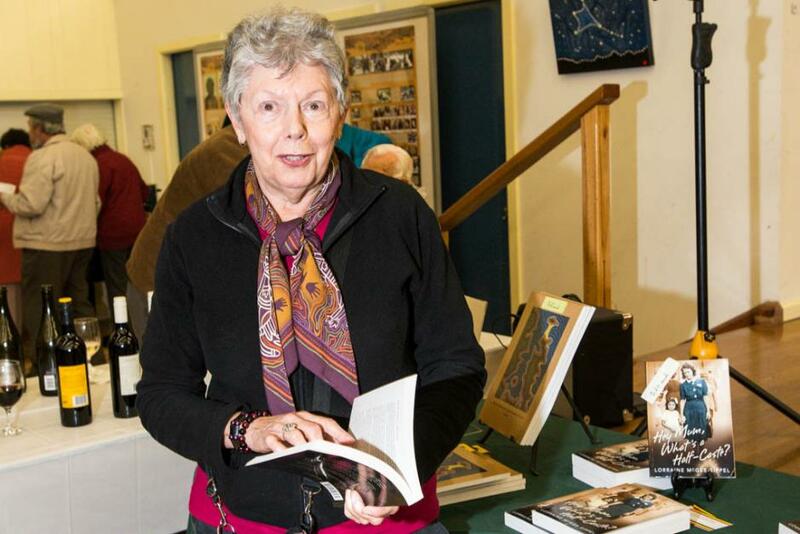 Kim Cameron with one of her works. Elley Cousins Narrabeen Lakes PS and her work. 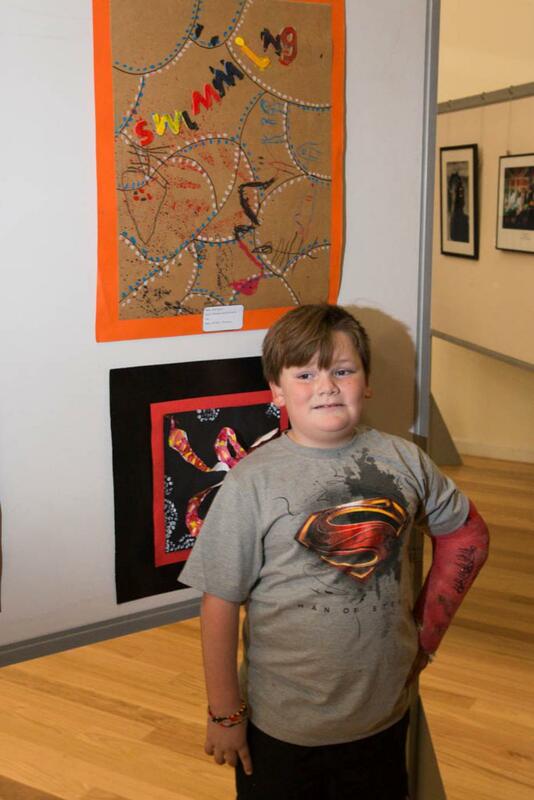 Kade Cousins Narrabeen Lakes PS and his work. Report by S Evers, Pictures by Michael Mannington, 2013.